If you have a leaking water heater, follow the instructions below or watch our video to turn off your leaking water heater, you can also call 951-688-1175 and one of our water heater experts will walk you through turning off your water heater. When you have a leaking water heater, you will most likely see water around the bottom of your water heater. This is typically the first sign that there is a leak somewhere in the tank. If there is not a visible leak, but it looks like the water is coming from underneath the unit, this is a sign that there is a crack in the inner tank. Look inside the bottom of the water heater chamber and see if there is water inside the bottom of the tank. If you see moisture, that is a sure sign that the internal unit is leaking. 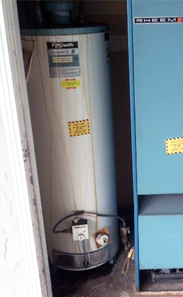 When this happens your water heater will most likely need to be replaced. On occasion a water heater can begin to a leak from the top, this is typically caused by a fitting or a part of the plumbing that has malfunctioned. Check the water connections where they come into the tank and also check the connections where the pipes connect to the plumbing in the wall. If you feel wetness at either of these locations, this is a sign that the water leak is most likely coming from the piping. 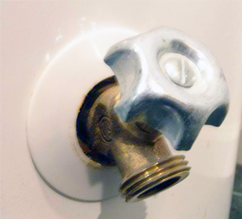 When this happens, the water heater can often be repaired. The other most common type of leaking water heater is when the temperature / pressure safety valve, also known as the t/p valve, opens and releases water due to excessive temperature or pressure. This valve usually has a pipe attached to it that runs down to the floor or is piped to the outside of the home. If the temperature inside the tank gets too hot, if the incoming pressure gets to high or if you have thermal expansion in the plumbing system inside the house, the safety valve will release water . Once the excessive temperature or pressure build up has been relieved the valve will close back up. When this happens, it’s a good idea to keep a close eye on your water heater, if it happens multiple times you should call for advise or for an appointment to diagnose the cause of the the problem. Read more about the t/p valve in our FAQ section on our main website. If you have any of the leaking water heaters described above call 951-688-1175 and a water heater expert will assist you. We can help in turning off the gas or electricity and the water to help minimize any possible water damage. Then schedule an appointment for a Water Heaters Only, Inc Riverside technician to come to your home and diagnose the problem with your water heater. 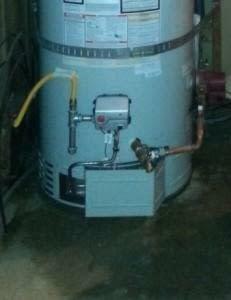 Our technician will let you know exactly what the solution is and can replace or repair your water heater right away. 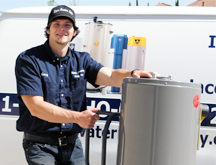 Water Heaters Only, Inc Riverside has customer service experts available 24 hours a day. 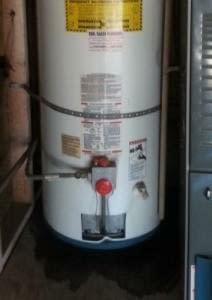 Give us a call now and we can help with any water heater problem you are experiencing 951-688-1175. 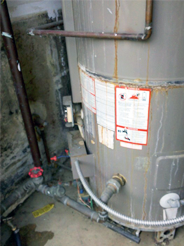 Here are a few different leaking water heaters we have been called out to replace. As you can see from the pictures below water heaters can leak in a variety of ways. Long term leaks are apparent in the build up of rust and corrosion on the tanks. Having a problem with your hot water? One sure sign that your water heater isn’t working properly is when you have no hot water or the loss of hot water. Most people know that, but they might not know that there are a few simple diagnostic tests they can do to take care of the problem. The first thing to do is figure out what kind of water heater you have. Is it gas or electric? If you don’t know, feel free to call us at 951-688-1175 and we can help you determine what kind you have. Once you know that, then scroll down to the section for your water heater for specific, helpful tips. If it’s a gas water heater that you have and it isn’t producing hot water, then it is likely that the pilot light has gone out and needs to be lit. Watch our instructional video below for assistance. However, the lack of hot water could also mean that a part has malfunctioned and needs to repaired or replaced. 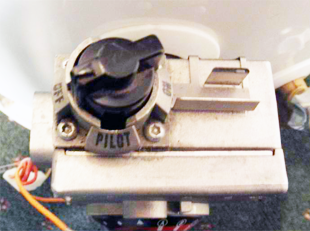 If you have tried to re-light your pilot and it won’t stay lit or if it is lit, but you still don’t have hot water, then it’s time to call in the professionals. Give us a call and we will be happy to send over one of our highly-trained technicians to take care of the problem for you. He will have the parts and, usually, you’ll get same-day service. For additional information on gas water heaters, please refer to our Water Heaters FAQs section on our main website. Electric water heaters operate a little differently than gas water heaters, but that doesn’t mean a homeowner can’t do anything to fix the problem. It’s possible that the electric water heater has tripped a breaker. If you can access your breaker box, then check there first. If no breaker has been tripped, then it could be a number of different problems including a faulty thermostat and it’s once again time to call in a professional. Just call 951-688-1175 and let one of our highly-trained technicians come and assess the problem for you. This is the big question, of course, and can vary quite a bit depending on what size and type of unit you are having installed. Other factors that can affect the amount you are charged include any plumbing upgrades or code requirement work that may be necessary to properly install your new unit. Most cities now require a permit for the installation of a water heater and that means there are specific guidelines that must be followed when we install your water heater. 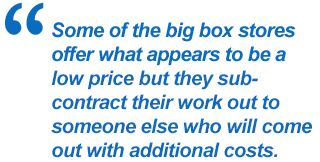 Before we talk any more about cost, remember this: “Water Heaters Only, Inc. guarantees the lowest installed price”. Also, we will beat any competitor’s on-site, written estimate. It’s as simple as that. So don’t be fooled by a low estimate given over the phone or online, especially from a big box store. Often, a low pr ice is quoted and then the price sky-rockets when the plumber arrives to do the job. Please feel free to read our customer reviews and see for yourself what people are saying about their experience with Water Heaters Only, Inc. Then go ahead and get a few bids from other companies. You’ll see what our previous customers already know – our prices are the best! When we do an install, your water heater gets installed correctly the first time using quality products that are guaranteed. We also offer 24/7 technical support, so you can call at any time with questions about your water heater. Call us now at 1-951-688-1175 and let one of our water heater experts answer any question you might have or to schedule an appointment today.